Proudly serving the Metro Richmond and surrounding areas since 1996. Why Use A1 Asphalt Paving? A1 Asphalt Paving & Sealing, LLC has performed quality asphalt paving and milling projects in the Richmond and surrounding areas since 1996. We are a small family owned business that takes pride in our work. Mike Baughan, the owner and operator of the company has been in business, as A1, since 1996. We pride ourselves on our outstanding Better Business Bureau record, a rare find in today’s paving business. Proudly, the majority of our work is through customer referrals. 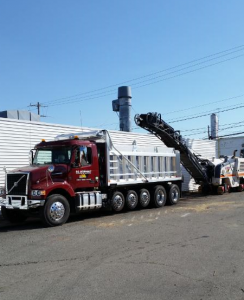 A1 Asphalt Paving & Sealing, LLC owns and maintains the commercial trucks and VDOT approved equipment to ensure quality, efficient parking lot paving. Our equipment, along with our experienced crew is key in handling your asphalt paving job with minimal disruption to your business. The demographic area of our services for all parking lot paving and maintenance needs cover not only the central Virginia area, but reach from Fredericksburg / Northern Virginia area to Petersburg, Colonial Heights / the North Carolina border. From points East, such as Chesapeake, Norfolk, Newport News and Virginia Beach area reaching to points in the West to the Charlottesville / Waynesboro areas. Click here too see our business review at the Better Business Bureau. A1 has been an accredited business since 1999 with an A+ rating. Insurance Certificates are available upon request for all commercial contracts.